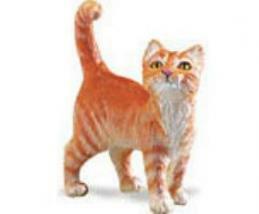 Cat Figurine Critter Keeper Stone Critters is cat lovers collectible at Animal World®. This Critter Keeper cat statue features a round orange tabby cat and opens to reveal a mouse inside when you remove the back of the cat. Cast stone and hand painted this Stone Critters Cat Figurine measures 3"L x 3"W x 3"H. Shop our Cat Lover Gifts Store page for additional Cat gift items.